Has your hairdresser ever told you to finish off rinsing your hair in cold water? I do have to say I am guilty of not finishing my shower off with cold water, because no one wants to step out of the shower freezing their bum off! But there are so many benefits to rinsing your hair with cold water. Cold water closes up your cuticles protecting your hair from damage as well as eliminating some frizz. It is good to shampoo and condition under warm water, when your cuticles are open, but once you are done sealing up the cuticles with cold water seals in the beneficial properties from your conditioner and shampoo. The only downfall is if you have thin hair this make make it look thinner. The same concept applies to the pores on your scalp. Warm water allows the shampoo to cleanse out the pores on you scalp, but once you finish you want to use cold water to close the pores in order to prevent them from getting clogged with oil, grease or dirt. 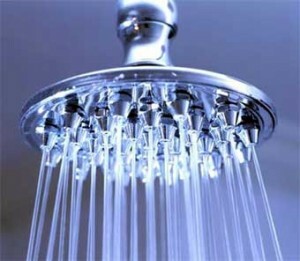 Cold water also promotes blood flow, which will improve circulation on your scalp. This has been said to help promote hair growth. Hope you enjoyed this weeks Fun Tip Friday! I am going to get better at finishing my shower with a cold rinse. You should! Let me know if you see any difference! I do this too, and it makes my hair so shiny! Perfect! I need to start doing this more! That’s exactly what I’m saying! I live in Florida and the humidity is crazy. So any little thing helps!